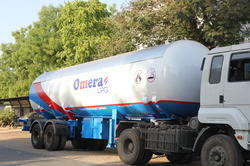 Leading Manufacturer of lpg gas tanker, lpg mobile tanker and lpg bobtail from Vadodara. We offer a precision engineered range of LPG Gas Tanker , that are extensively used in diverse industries to transport LPG from one place to the other. Fabricated from finest grade material, these tanks can suitably store liquids and gases under high pressures and are highly durable, sturdy and resistant to corrosion. Our range is available in varied specifications and can also be custom designed as per clients' requirements. This is one of its kind LPG mobile tanker with pump,meter,hose and hose reel. It can deliver gas safely upto 20mtere of distance with LPG hose. The tanker contains all safety inerlocks pneumatically controlled by vehicle air. The vehicle can measure the flow of gase upto 0.2% of accuracy.